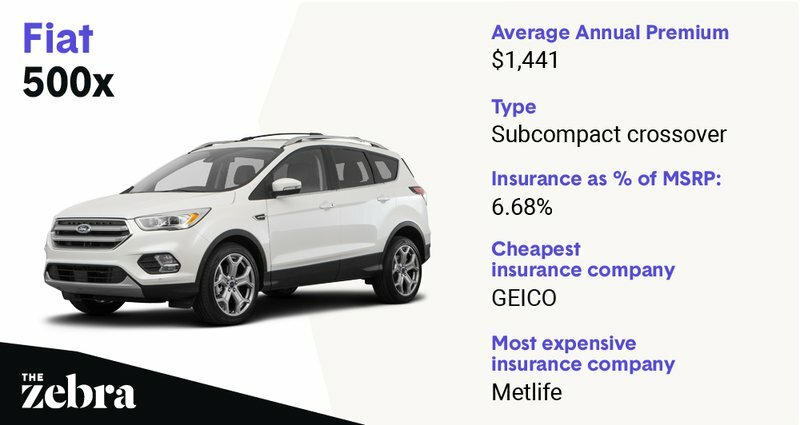 What's the Least Expensive Car to Insure in 2019? 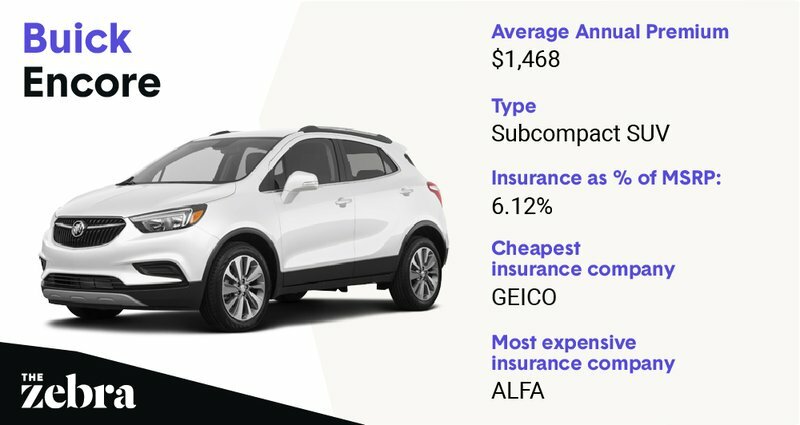 What's the Cheapest Car to Insure in 2019? Across the nation, car insurance prices are increasing. Between 2011 and 2019, the average auto insurance rate increased by 23%. In fact, four out of five Americans experienced a significant rate increase in 2019. One of the primary contributors to auto insurance rates is the make and model of the insured vehicle. High-performance vehicles and luxury SUVs are among the most expensive cars to insure, based on their steep cost-of-replacement and pricey parts. If you're looking for cheaper monthly premiums, consider a basic sedan or a compact SUV. See below the 10 cheapest cars to insure in 2019 (methodology). The Subaru Outback comes with the added bonus of the nation's most affordable insurance rates. Typical insurance costs are only 5.19% of the vehicle’s total manufacturer-suggested retail price (MSRP). 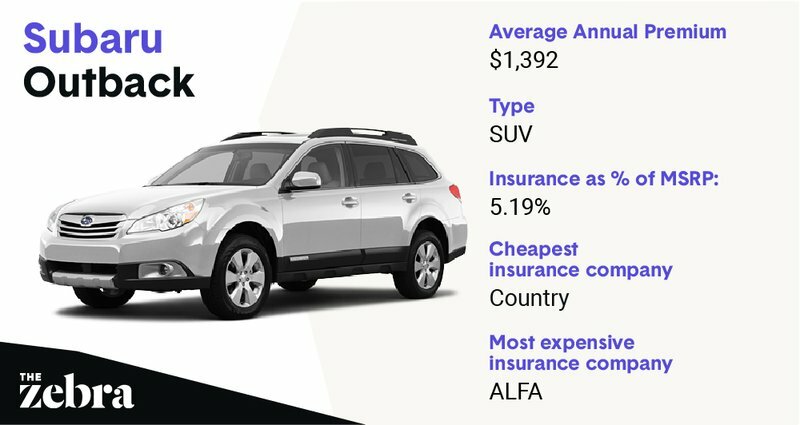 On average, the annual insurance premium for a Subaru Outback is $1,392. If you’re looking to save, Country Financial offers the lowest car insurance rates for an Outback. ALFA offers coverage at a much higher cost. The average annual premium for the Chevrolet Colorado is $1,414. Most insurance companies recognize these vehicles as cheap to repair, which is why your insurance premium is only 4.93% of the total MSRP. 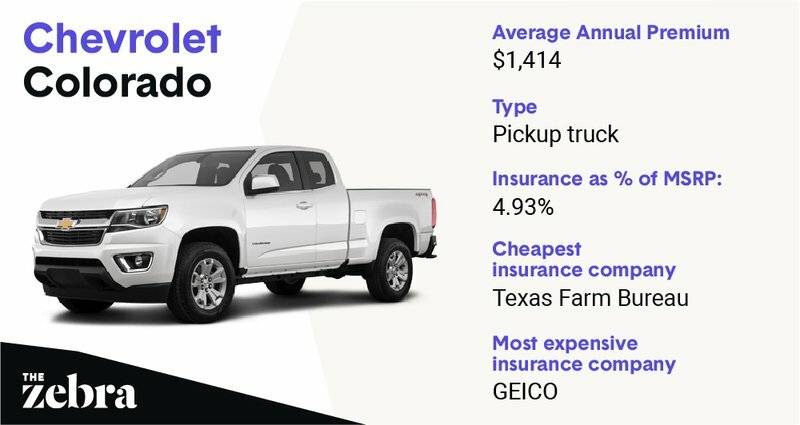 Texas Farm Bureau covers the Chevrolet Colorado for the least, with annual premiums of just $735. GEICO's policies cost quite a bit more — around $1,904 per year. If you drive a Ford Escape, good news — your annual premium should be around $1,438. As one of the cheaper cars to insure, premium costs sum to just 5.77% of the vehicle’s MSRP. Plymouth Rock Insurance offers reasonable rates for compact sports utility vehicles such as the Escape — around $561 per year. If you’re willing to spend more, Liberty Mutual provides solid coverage and assistance. Auto insurance premiums are low for the Fiat 500x. Your insurance costs should only be about 6.68% of the vehicle’s total MSRP. The average annual premium for a Fiat 500x is $1,441. If you’re looking to save, GEICO offers the lowest car insurance rates. You can still get excellent coverage with Metlife, but at a much higher cost. Compare rates for your SUV instantly! The average annual premium for the Subaru Crosstrek is $1,446. The Crosstrek boasts affordable maintenance costs, leading to an insurance premium of just 6.37% of the total MSRP. 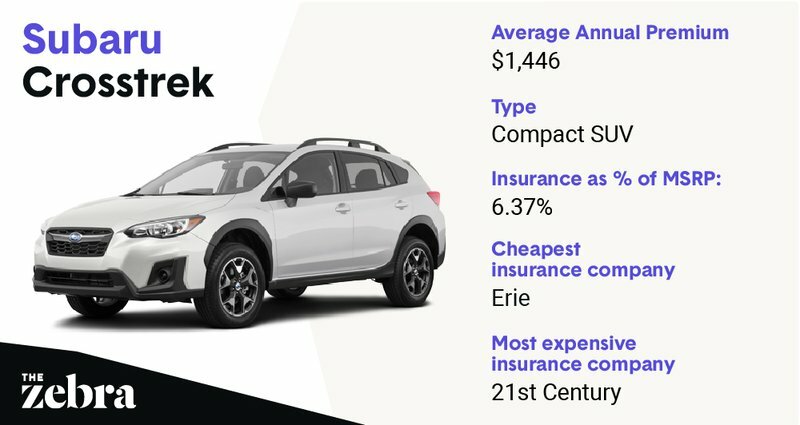 Erie covers the Subaru Crosstrek at the lowest cost — an annual premium of $476. 21st Century offers coverage at a higher price. If you have a Jeep Compass, good news — your annual premium should be just $1,449. 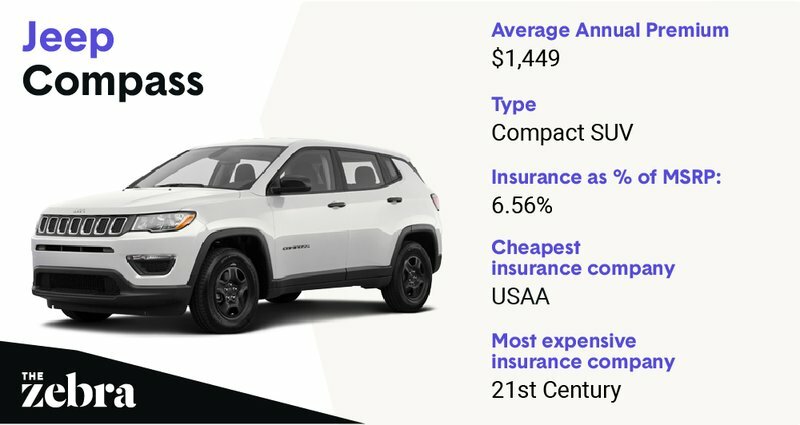 As one of the cheaper cars to insure, the Jeep's insurance-to-MSRP ratio is just 6.56%. USAA tends to assign low premiums to this model, with an average annual premium of $574 However, if you’re willing to spend more (on average, $1,209 in annual premiums), 21st Century might offer superior coverage and assistance. With a subcompact SUV like the Honda HR-V, you can expect your car insurance premiums to be pretty low. Your insurance costs should only be about 6.82% of the vehicle’s total manufacturer's suggested retail price. 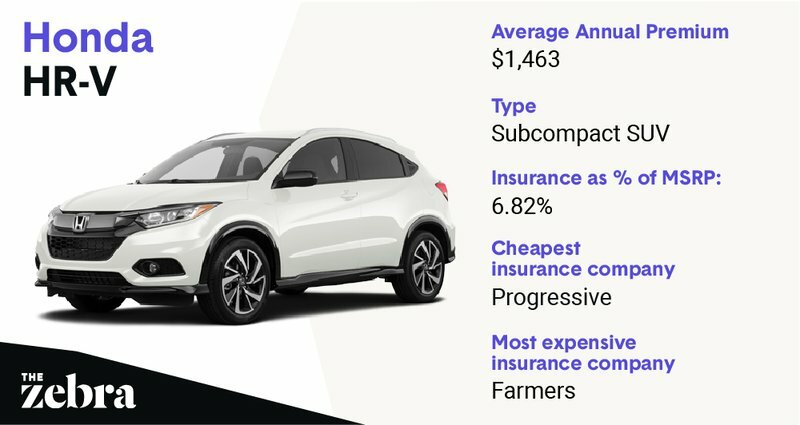 On average, your annual premium for a Honda HR-V will be $1,463. But if you’re looking to save, Progressive offers the lowest car insurance rates for this car. Farmers will also offer excellent coverage, but at a much higher cost. The average annual premium for a subcompact SUV such as the Buick Encore is $1,468. Most insurance companies recognize these vehicles as cheap to repair, which is why your insurance premium is only 6.12% of the total MSRP. GEICO can cover your Buick Encore for the cheapest at an annual premium of $551. ALFA will cost quite a bit more, but they will still offer top-rate coverage for your vehicle. If you have a GMC Sierra, you’re in luck — your annual premium should be around $1,474. The Sierra's typical auto insurance cost totals just 3.64% of the vehicle’s MSRP. 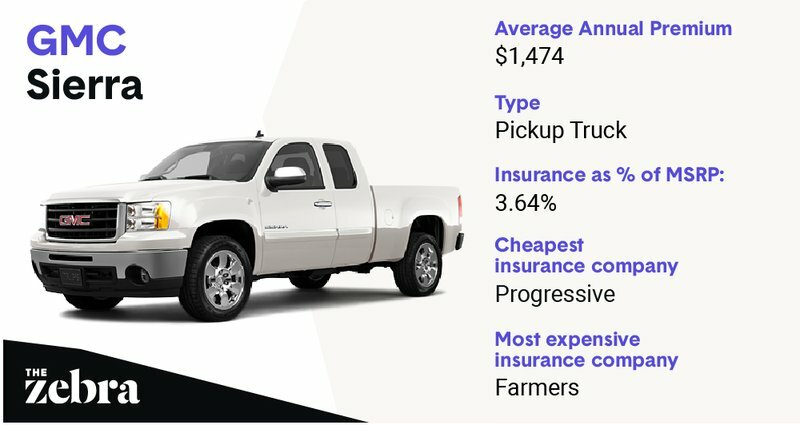 Progressive tends to give low rates to pickup trucks, around $364 in annual premiums. However, if you’re willing to spend more (on average, $1,041 in annual premiums), Farmers provides superior coverage and assistance. 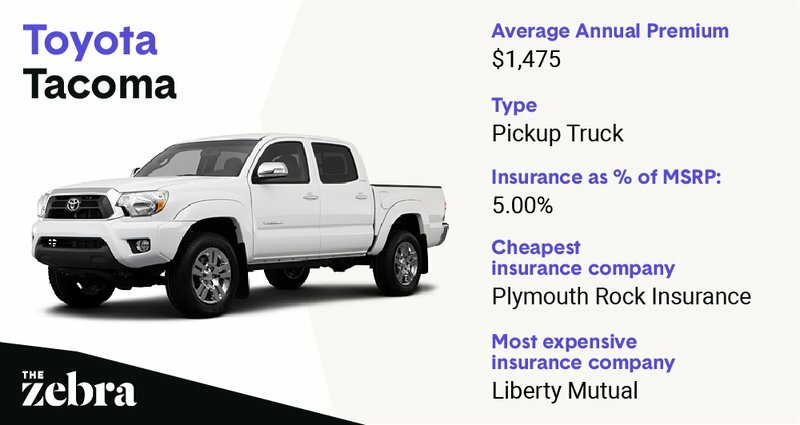 The average annual premium for a pickup truck such as the Toyota Tacoma is $1,475. Most insurance companies recognize Tacomas as cheap to repair, assigning insurance rates of just 5.0% of the total MSRP. Plymouth Rock Insurance can cover your Toyota Tacoma for the cheapest at an annual premium of $711. Liberty Mutual will cost quite a bit more, but they will still offer top-rate coverage for your vehicle. Compare rates from the cheapest insurance companies in the nation! This analysis used a single insured driver profile: a 30-year-old single male with a clean driving record and coverage limits of $50,000 bodily injury liability per person/$100,000 bodily injury liability per accident/$50,000 property damage liability per accident, with a $500 deductible for comprehensive and collision, driving a 2013 Honda Accord EX. For coverage-level data, optional coverage — that must be rejected in writing —is included where applicable, including uninsured motorist coverage and personal injury protection.